Its the KYB week of Kolkata Food Bloggers, where we have decided to pick a recipe each from fellow blogger Priyadarshini’s blog ‘Let’s talk food’. With the immense variety of recipes on her blog, one is spoilt for choice. It took me a while to zero-in on this recipe, because there were so many alluring ones. The murgir bhorta, for example, is totally tempting. However, since Kasturi (the restaurant she was referring to in her blog that serves lip smacking east bengal cuisine) is a family favorite with my Ghoti family too, I think am gonna head there and have it first, and then attempt it back home. 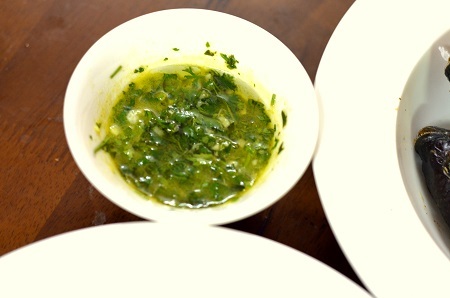 The chimichurri, originally an Argentinian favorite for grilled meats, goes splendidly with white meat and especially with sweet water fish. 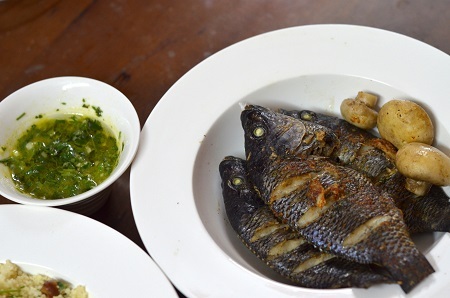 For the baked fish, Priya has used bhetki, while I am using whole Tilapias – the tilapia we get in Bengal is different from the one people get elsewhere, here we refer to small darkish, fresh water and much tastier varieties of what is perhaps the same species of fish. Got some really fresh stuff from the customary weekend fish market shopping this morning – in fact I have made an odd number because the fourth one is still alive and the husband has kept it in a bucket of water, and the little guy is still swimming around so we don’t have the heart to, you know…In fact I even asked out aloud if he was food or pet, husband said he’ll think about it later meanwhile if I could hand him some food for the fish. Here is the link to Priya’s recipe, and I have not changed it much. and grilled it in the oven at 180-200 deg C for 20 mins. I marinated some mushrooms along with the fish and grilled it along. Went well with the couscous. Again, I keep the couscous simple with chopped dates and walnuts, parsley and cilantro leaves, some salt, paprika, rounded off with a blob of warm butter melting into the couscous. While I had made a sashlik dressing that was very similar to it except it only had parsley, I have to say the chimichurri sauce was superlative and Priya deserves a shout out for this. There was a fight over it at the dinner table. I did not win it, but looks like I may have won something larger. Needless to say I’m gonna make this more often, with a lot many other combinations. *Tip: In order to get rid of other strong flavours in the oven, I placed a squeezed lime along with the fish.